In recent months two important articles by Yehuda Kurtzer and Gidi Grinstein opened a conversation that is no less than crucial to the Jewish future. I would like to humbly add my perspective to this conversation. While agreeing with most of their analysis and recommendations I would like to highlight one dimension that is key to the challenge at hand. I full heartedly agree with Kurtzer that “Israeli Jews and American Jews are on diverging paths” and that “it is time to take each of these communities seriously on their own terms”. And yet the answer does not reside solely in figuring out how to sustain a co-existence between communities on diverging paths. What must be reconfigured in this changing context is the nature of their common identity. What ethos and vision can constitute their Jewish collective identity? What current interpretation of Peoplehood can substantiate a shared sense of destiny, solidarity and responsibility between the members of the two communities that will only continue to diverge and look less and less like each other? I applaud Gidi Grinstein for describing the Israeli perspective of American Jewry using realistic and true colors. Frankly the Jewish people in general is not really on the Israeli screen, except when tragedies or troubles occur. I also believe that approaching the issue through Israel’s role as the nation state of the Jewish people is a productive approach. After all, if we demand that the Palestinians recognize Israel as the nation state of the Jews that’s the least we can demand of Israelis. And yet, being a nation state of the people is only derivative of the greater belief in the people itself as the entity the State serves. Without a true commitment to the Jewish people as the defining entity, being the nation State may prove to be empty words. My point than is that any attempts to seriously address the gap or of finding a way to proceed forward as diverging entities that are part of one larger whole, must go through a re-articulation of their common destiny. Of what binds and connects them. Of what the essence and meaning of their Peoplehood is all about. This means both good and bad news. The good news is that Jews have mastered through history the art of reinterpreting, re-imagining and re-envisioning their collective identity. The less good news is that the challenges today are new and complex and there is no guarantee for success. One of the biggest challenges towards the creation of a of a collective Jewish ethos and destiny today is the different interpretation given to Peoplehood in the two communities. To use Rav Soloveitchik classic differentiations between a covenant of fate and a covenant of destiny, one can say that most Israelis view the Jewish people and the world through the joint-fate prism. It represents the more classic paradigm imposed on Jews by outside forces that nurtures solidarity, empathy and a sense of responsibility for fellow Jews. It also enables and justifies a particularistic approach sometimes even at the price of compromising universalistic values. Or as the Israeli Minster of Justice recently said: “Zionism should not continue, and I say here, will not continue, bending its head in front of a human rights system universally interpreted”. On the American side, in the land of Jews by choice, there is a natural tendency towards a covenant of destiny. There is constant search for what can justify and provide purpose and meaning to the Jewish enterprise. 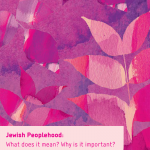 A good answer to: “why be Jewish?” A search for values that will drive and give meaning to the Jewish enterprise. In that context compromising values for particularistic considerations, as we sometimes see on the Israeli side, is problematic. This is a source of contention that the current crisis with the American leadership is just a preview of (wait until the millennials come to power). One needs to understand that it not a communication or political gap we are facing. It is an identity challenge that conceals a cultural struggle on the nature and purpose of the Jewish collective enterprise. On one side, the continuity of the Jewish enterprise and wellbeing of its members are the ultimate goals. On the other, the added value of Judaism to humanity and humanism are the true measures of success. An injection of a dose of each community’s unique spirit into the mind of its sister community. American Jews need to wrestle with versions of empathy, solidarity and responsibility that do not necessary spell particularism. One can hang on to a responsibility for the Jewish people and Jewish civilization without having to let go of one’s universalisitic responsibilities. Israelis, on the other hand, need to go back and wrestle with the vision and values that drive them as members of the Jewish collective. As Ben Gurion says in a documentary recently released when asked if Zionism succeeded: “Not yet. Only when we start helping others”. The answer than is, that the potential for narrowing the gap between Israel and the American Jewish community exists. And yet as Kurtzer points out “after decades of bar mitzvah tours, Birthright trips, intense investment in Israel education”, … “most Jews increasingly do not feel that the metaphor of the Jewish people as family effectively describes their relationship to one another”. Grinstein on the other hand describes in frustration the “Israel-Diaspora dialogues groups activity ” as a “missallocation of resources”. The implication is that the existence of a potential does not promise success. The above are reflections of the complexity of the issues and our need to be humble in trying to resolve them. I want to begin by endorsing in principle both the approaches suggested by my colleagues. I do however believe that without proper attention to the reconfiguration of our collective destiny and agenda neither of the approaches will get far. This entails an intellectually rigorous dialogue among leaders of multiple groups in the communities representing its various constituencies, about our shared vision and destiny. While I agree that it is time to challenge the Israelis with this agenda, Grinstein’s recommendation, “to give the work back to the Israelis”, concerns me. I strongly believe that the process should be implemented together in partnership. With all due respect to the change agents proposed, representatives of American Jewry need to be deeply involved in the process. While the focus on the Israeli side is a refreshing step in the right direction the situation on the American side is far from ideal. Addressing the challenge of Israel through the Peoplehood lens can strengthen both the Zionist and Peoplehood causes. The term diaspora connotes a sense of dispersion which does not really apply to the Jewish American state of mind. American Jews are very much at home in America. At the same time, the term Diaspora, by design, invokes status issues (more vs. less equal) that get in the way of a true dialogue of equals. It is time we seek a new framing that is true to the Jewish American state of mind and provides a current basis to building the future relationship. By Jewish design this period in the year is dedicated to reflection, cheshbon nefesh as well as forward thinking. Some of our communal cheshbon nefesh should be dedicated this year to the way we treated our fellow community. How much did we invest in understanding its challenges? How much of a true dialogue did we pursue? Did the need to reconfigure our common destiny even crossed our threshold? I wish your appraisal of the power of the North American Jewish community to withstand the power of the antisemitic forces at work here, and retain a sense of Jewish identity, but I don’t believe that we can do it unless and until we face the reality of these forces and provide our children with a coat of armor sturdy enough to do so. This coat of armor consists of education on the history of our people which conveys the enormity of our survival. No other nation has survived a history like ours, and in turning away from the gifts our forefathers lived and died to transmit to us we are giving up on their dreams for us. We must teach them that we are the indigenous people of the land of Israel so that when the Arabs cry foul we can prove that we have simply retaken the land that was stolen from us albeit repeatedly in the last 2,000 years. If you do not instill this in the young, you will fail to give them the vision necessary to bind them to our peoplehood. Nothing less will suffice so that when they are confronted in school with accusations that we have stolen the land from the indigenous Palestinians they will have the facts available to dispute this lie. Until you provide them with this armor they will continue to be at the mercy of the social justice warriors who control the educations system here, and turn their backs not only on Israel, but on Jewish peoplehood as well.